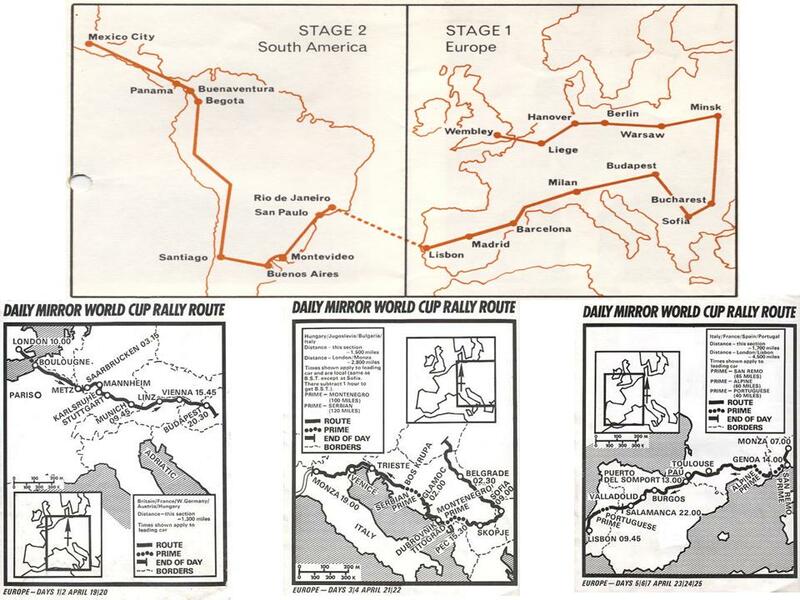 The 1970 London-Mexico World Cup Rally was the first of two World Cup Rallies to be held and the second of four marathon rallies to be held in a nine-year period beginning with the 1968 London-Sydney Marathon. 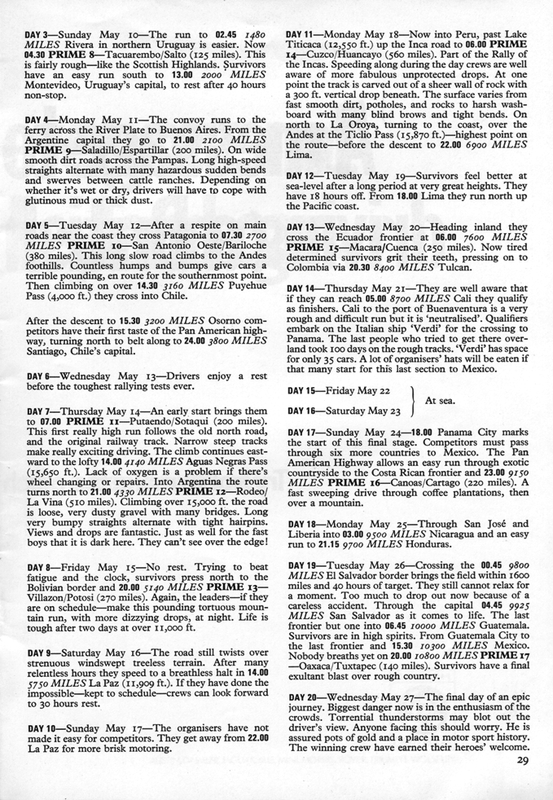 The motor rally started at Wembley Stadium in London on 19 April 1970 and finished in Mexico City on 27 May 1970, covering approximately 16,000 miles (25,750 km) through Europe and South America. 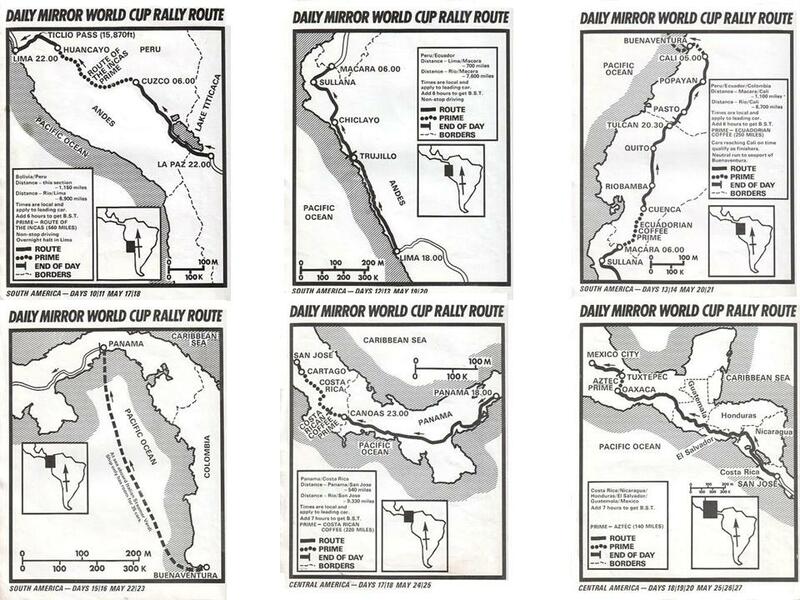 Almost 100 cars, spanning a variety of works teams and private entries, would follow a challenging route of road sections and special stages from London to Lisbon then, after a sea passage to South America, rejoin the battle in Rio de Janeiro for the journey to Mexico City. Reflecting the relentless pace of the Rally and the punishing terrain over which it was run, just 23 of the original starters would make it to the finishing line at Mexico City’s Aztec Stadium. 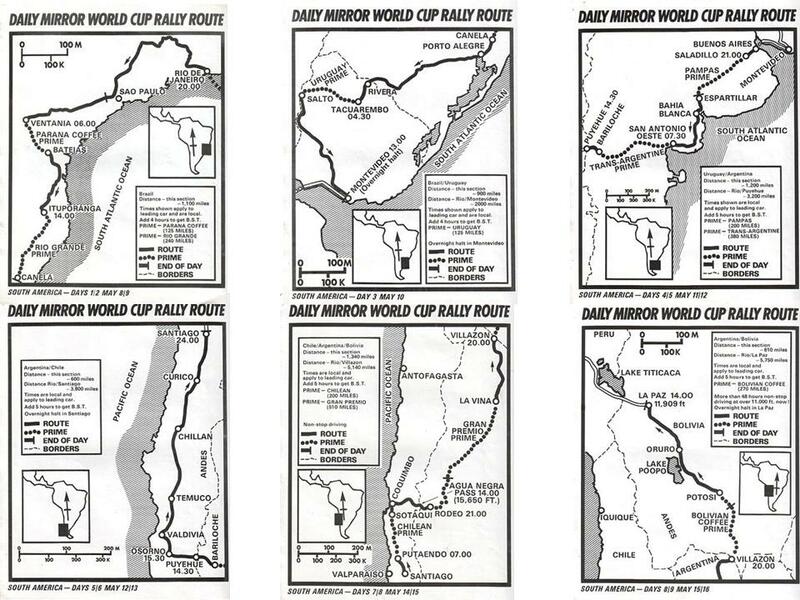 These are the route cards, printed on card, which were issued to the crew and formed the principal part of the briefing for the rally! 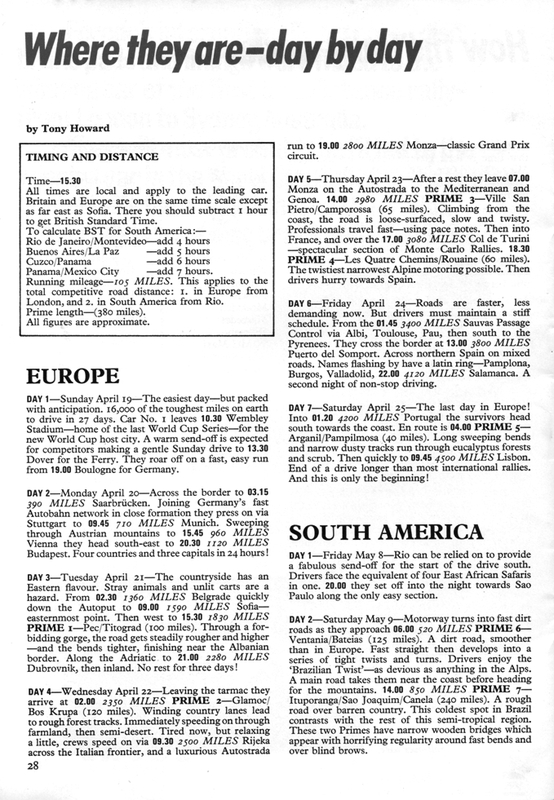 This route day-by-day description, with timings and distance, is taken from the official World Cup brochure. In 1968, VPI 77 was prepared at the Ford Performance Centre, Boreham to take part in the 1968 London to Sydney Marathon. It was driven in the event by Rosemary Smith and Lucette Pointer. 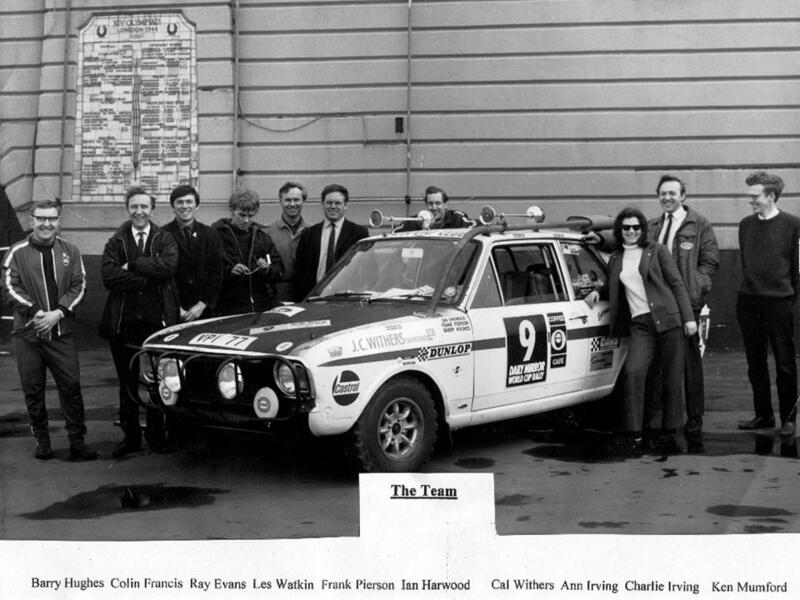 For the 1970 London to Mexico rally, Cal Withers initially trusted the preparation of the car to a Fred Livesey of Hazel Grove. The idea was to fit a Ford V6 engine, ZF gearbox and Taunus rear axle to give the strength and reliability required for such a punishing event. 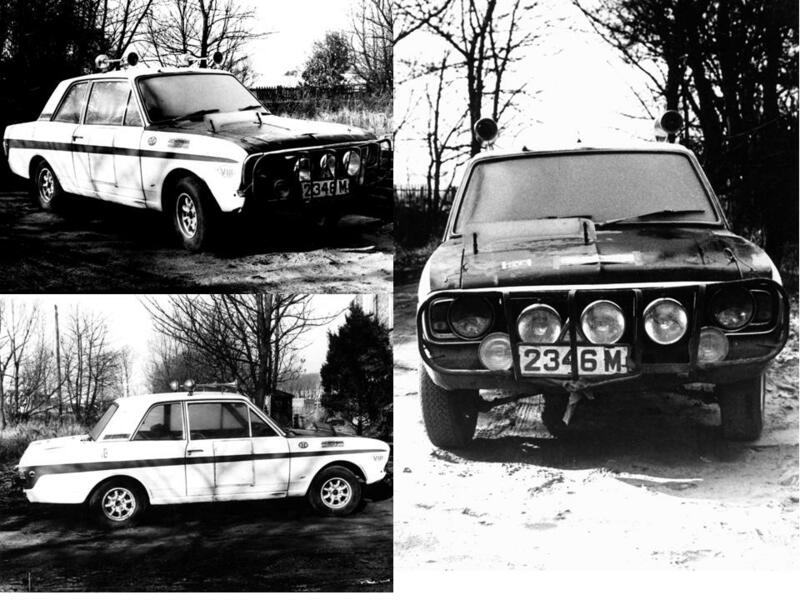 On the 8th of April 1970, ie 10 days before the car was due to set off on a 16,000 miles marathon, it looked like this when Frank Pierson went to check on progress. The story goes that Fred was a keen budgie breeder. During the period when every one thought he was working on the car, one of his prize birds was taken ill. Fred lost all interest in his work, but forgot to tell anyone that no progress was being made on the Cortina, and it was still a box of bits on the floor. By shear hard work, on Friday 17th April, the engine and gearbox were in situ. and the prop shaft arrived, but instead of being 47″ long, the manufacturer made it 4′ 7″ long, ie 8″ too long. So it had to go back to the manufacturer for a quick chop, and this probably contributed to a major problem with vibration experienced later. Another last minute build problem concerned the clearance, or rather lack of clearance between the air cleaner and the bonnet. This was overcome by Pete Darlington, the metal magician, cutting an International Tractor fuel tank in half and welding it into the bonnet as a ‘power bulge’. At 3.00a.m. on the 18th April, the car was dropped onto its wheels and driven to Whitchurch to fuel up. The transmission vibration was horrendous, and it was feared that the car would shake itself to bits in a few miles. There was no option but to drive down to Wembley, (about 180 miles from Whitchurch) at the least vibration speed, (about 48 MPH), and hope that something could be done after scrutineering. Fortunately, Cal had arranged to use the workshop facility of Godfrey Davis Ltd. 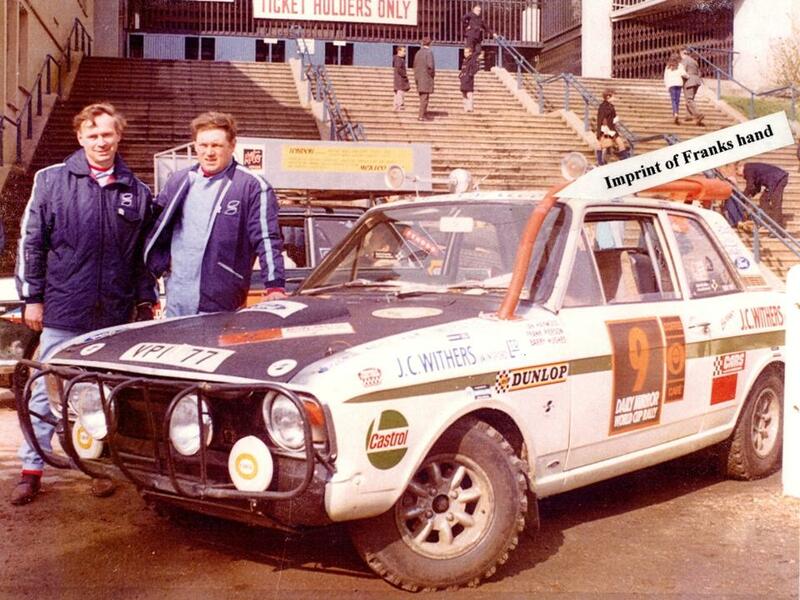 In Wembley, and after scrutineering, the car was taken there and put onto a ramp. The major source of the vibration was found to be the diff. angle. In fitting the Taunus rear axle, ‘budgie man’ had failed to consider the importance of the spring seat plates, and had simply welded them on at right angles to the diff. instead of at an angle to raise the front of the diff. up. To overcome the problem, a set of alloy lowering blocks was purchased from a local motoring shop, and these were cut at an angle to lift the nose of the diff. up, and lower the suspension slightly at the same time. This mod worked a treat and was trouble free throughout the event. The pre start dramas were still not over. Whilst trying to clean the windscreen, Frank lost his footing on some gravel as he was leaning across the car and promptly grabbed hold of the exhaust to save his fall. The white mark on the exhaust pipe and subsequent glove on Franks hand confirms that the exhaust was in fact quite hot when he carried out this manoeuvre, and was very painful for the European leg of the rally.